Overview: In a race to beat the communists to space, scientist Reed Richards leads his best friend, Ben Grimm; his girlfriend, Susan Storm; and her brother, Johnny Storm; in an unshielded rocket to the stars. Cosmic rays bombard their spacecraft, forcing the quartet to return to Earth. They soon discover that the cosmic rays have changed all of them. Reed’s body has become elastic, and takes the name of Mr. Fantastic. Susan now has the ability to disappear at will, and becomes the Invisible Girl. Johnny bursts into flames, and adopts the moniker of the Human Torch (a nod to a Golden Age hero). And Ben Grimm becomes a misshapen lump of clay, soon to become rock-like, and dubs himself The Thing. So begins the Fantastic Four! Each month, a new villain would appear on the scene, and it would take the combined efforts of the Fantastic Four to halt the latest menace. From shape-changing Skrulls from outer-space to the Red Ghost and his Super-Apes in outer-space, and from the controlling mind of the Mad Thinker to the mind controlling of the Puppet Master, the Fantastic Four faced all challenges head on. Perhaps the greatest villain in Marvel Comics was introduced in issue #5, when the FF came face-to-face with Dr. Doom, monarch of Latveria, who wants nothing more in life than to exact his revenge on Richards and his family. What makes this Essential? : This is the cornerstone of the Marvel Universe. If this title had not succeeded, we probably would not have seen Thor, Hulk, Iron Man, Spider-Man, the X-Men, and everyone else that came after the launch of the Fantastic Four. Consider these 21 comics as Marvel’s Declaration of Independence, that told the comic book marketplace that they could do the same books as DC, and they can do them better. The Marvel heroes are real people, with their own character faults and issues. They may bicker and fight, but in the end, they stand together to make things right. Maybe Lee and Kirby were borrowing the challenge issued by then President Kennedy who had proclaimed earlier in 1961 that the U.S. would put a man on the moon by the end of the decade. Lee and Kirby put the Fantastic Four on the moon by issue #13. 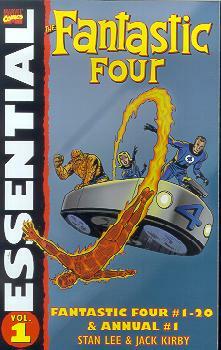 Footnotes: Even though Fantastic Four #1 was the birth of the Marvel Age of comics, Essential Fantastic Four Vol. 1 was the 11th Essential released by Marvel, nearly two years after the first edition hit bookshelves. I find it remarkable, given the FF’s place in Marvel history, that ten Essentials were released prior to the series getting its own volume. To put that in perspective, Fantastic Four Vol. 1 was one of the original Masterworks volumes (released concurrently with Spider-Man Vol. 1 and X-Men Vol. 1) in 1987, and the first thirty issues made up the first Marvel Omnibus in 2005. Its slot in the Essential line was basically taken in the beginning by Wolverine, which I’ve always thought was a strange publishing choice. Great questions, which I have wondered about as well. While I haven’t found anything definitive to support this answer, this is my opinion based upon what was going on at the time. The first volumes were released in October 1996. While I don’t know how long it takes to pull a volume together, for the sake of this discussion I will say that these were in planning for a year, so the initial discussion to make these books probably started in late 1995. In 1995, the core Marvel Universe titles, such as Fantastic Four, were performing so poorly that conversations were had about canceling some of the titles that had been running since the early 1960s. Marvel reversed course and decided to “outsource” these titles to Wildstorm, which was relaunched as Heroes Reborn by Jim Lee, Rob Liefeld and friends. When the contract expired after one year, Lee and Wildstorm walked away and Marvel (again) relaunched those titles with new #1 issues. As I recall, Marvel was not releasing anything using these core characters (FF, Avengers, Captain America, and Iron Man) during this time of the Wildstorm contract. So my guess is that when Marvel started to plan the Essential line, they might not have had the rights to put anything out with those characters during the 1995-1996 time frame. Conversely, the top-selling Marvel books were X-Men titles and Spider-Man. Wolverine was the biggest star of the X-Men franchise. So it makes sense that Marvel would start the Essential line with these titles. * Essential Spider-Man launched with a clean start, going all the way back to Amazing Fantasy #15 and moving forward. This gave Marvel one line of Essential volumes set in the Silver Age. * Marvel opted to start Essential X-Men with Giant Size X-Men #1 from 1974, bypassing the first 10 years of the franchise, but picking up with the start of the more popular X-Men line-up. This gave Marvel one line of Essential volumes set in the Bronze Age. * Essential Wolverine started with the ongoing Wolverine series that launched in 1988. (I find it very surprising that the original Wolverine miniseries from 1982 was not collected in this volume, or in Essential X-Men Volume 4. That’s a glaring oversight in my opinion.) This gave Marvel one line of Essential volumes set in the current age. Another consideration is the marketplace at the time, which was crumbling all around. Stores were closing left and right. Comics were distributed by multiple vendors, before everything consolidated into Diamond. And books of this size (500-600 pages) were not the norm. Most trades/collections at that time topped out in the 200-300 page range. I think Marvel was trying to take an idea from the Manga industry by releasing inexpensive reprints of existing materials; print the books in black and white and on cheap coarse paper to save money in the cost of production; and reprint material from your most popular characters. I don’t think they knew if these books would sell or not when they were first launched. Thankfully they did! That seems like a pretty reasonable explanation. I hadn’t even considered the outsourcing to Wildstorm as a factor, and it definitely does explain why Silver Surfer was the first line added after the original three, rather than FF, Avengers, or a solo book like Hulk, Captain America, or Iron Man. Rumor has it, as well, that the initial plan may have been to sell off some of those franchises outright, rather than simply outsourcing them — a plan which, if it did in fact exist, would likely still have been in effect by late 1995. It makes sense that Marvel wouldn’t have wanted to publish reprints of comic books it would no longer have the rights to in a few months! Additionally, if we’re assuming a one-year lead-in time for these first volumes, work on the initial volumes for FF, Avengers, and the Hulk would have been started around the time of “Heroes Return,” when it became clear those franchises were in-house at Marvel to stay. Overall, I think you’ve laid out a really compelling case. My recollection is broadly in line with Jerry’s but I seem to recall there was so much turbulance around Marvel in 1995-1998 that there wasn’t a great deal of continuity of decision making. Also I believe it was Lee and Liefeld who picked the properties they did after being offered anything but the still-selling X-Men and Spider-Man. I have a vague recollection that Marvel still put out some stuff involving the characters either in retro comics or reprints or the Amalgam titles with DC (and even the odd guest appearance by the Heroes Reborn characters in the regular titles) so I doubt they had signed themselves away completely from being able to reprint them. I just guess it was either a decision to focus on the best sellers at the time and/or a desire not to undermine the Heroes Reborn effort by having the originals so readily available. The Silver Surfer volume being the next character is probably explained by it originally coming out the same month as his television series and there was a mini-glut of specials and reprints to tie in with that. This began a trend for Essentials to tie in with such events – the first Hulk volume coincided with a relaunched on his book and I think the first Uncanny/Classic X-Men was about the same time as X-Men: The Hidden Years began. And of course no end of movie tie-ins. Pingback: Throwback Thursday – Essential Fantastic Four Vol. 1 | WORST. COMIC. PODCAST. EVER!